Updated Thursday July 7, 2016 by Lafayette Generals Football. I want to take this opportunity to introduce myself. My name is Jenni Williams and I am the Certified Athletic Trainer (ATC) at Lafayette High School. I am employed through the University of Kentucky Sports Medicine and have covered all athletics at Lafayette since 2001. 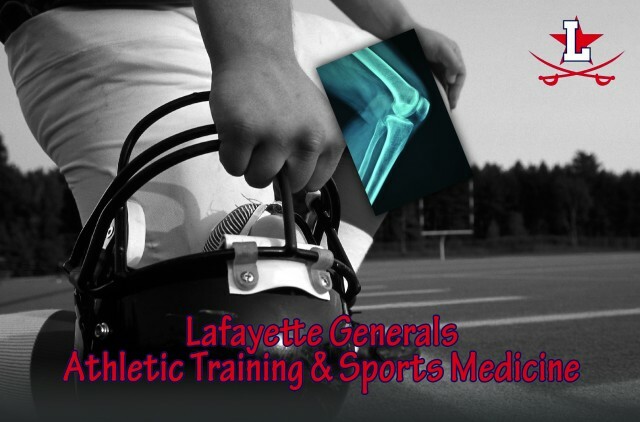 As an ATC, my duties consist of injury prevention, rehabilitation, and immediate evaluation and treatment of injuries under the supervision of the physicians at the University of Kentucky Orthopaedic Surgery and Sports Medicine. My education and knowledge of sports injuries allows me to assist your son/daughter with injuries which may occur. If at any time your son/daughter is injured, please inform the coaches and myself so they can receive proper care and treatment. The University of Kentucky Sports Medicine Clinic offers a Monday-Friday walk-in clinic at 7:30 am, located at 2195 Harrodsburg Rd, behind City BBQ. If you have any questions concerning athletic injuries please feel free to contact me. I am at the high school Monday-Friday from 3 to 7pm, (later on game nights). You may reach me by phone at 859-229-7643 or email at sjwill2@uky.edu. I am looking forward to a healthy season. Below are links and resources pertaining to sports related injuries. Please familiarize yourself with these materials as they are good educational resources that aid in injury prevention and after care.